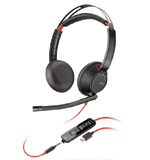 Plantronics Blackwire 5220 (binaural) has both USB-C and 3.5 mm connectors allow connection to many different devices. Comfortable enough to wear all day without fatique. When you’re on a call, Plantronics alerts you when you try to talk when muted. Customizable for voice alerts to your own language.